After a great career at Seton Hall and a few years of grooming with Pawtucket, the “Hit Dog” became a huge hit at Fenway, when he replaced Carlos Quintana as the Red Sox starting first baseman in 1992. During the next seven seasons he captured the hearts of all of Beantown with his clutch hitting and prodigious home runs on the field and his charisma and community work off of it. 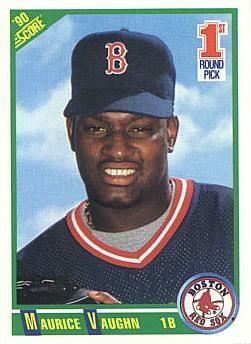 He was Boston’s “Big Papi” before there was a Big Papi. Mo could be counted on to give the Red Sox offense 35 home runs, 100 RBIs and average .300 every season and in 1995 he pretty much put the team on his back and led Boston back to the playoffs with a performance that won the AL MVP award. But he was cursed to be on a Boston team during an era when both the Yankees and the Indians fielded just slightly better ball clubs. If New York didn’t prevent them from making playoffs during the regular season, Cleveland would knock them out in the first round of the postseason. I’m pretty sure it was the club’s failure to find success in October that caused the Boston front office to play hardball with their best offensive player, as Vaughn’s contact neared its end during the 1998 season. The negotiations got real ugly in a real hurry. Vaughn was very public with his bargaining stance. He insisted he had put up the numbers on the field and the PR effort off of it to deserve the biggest of bucks and he expected to be treated with respect. Evidently, Boston GM at the time, Dan Duquette had hired an investigator to follow Vaughn when he wasn’t in uniform and reports leaked out alleging that the big guy had a propensity to visit strip clubs during his off hours. Hungry Boston sportswriters reported every detail of the bitter squabble and before you know it, there was no mo’ Mo in Beantown. He signed a huge deal with the Angels but after two good initial seasons, the injury bug hit the Norwalk, CT native and Vaughn missed the entire 2001 season. Vaughn then became a belated Christmas present for New York Met fans when on December 27, 2001, California swapped him for the Amazin’s starting pitcher, Kevin Appier. He certainly did not prove to be a gift that keeps on giving when he got to the Big Apple. He was 34-years-old when he first put on his Met uniform and his knees were shot. His 26-home run, 72 RBI performance during his first season at Shea would have been fine if he was a raw rookie but New York was paying him over $17 million a year and Met fans let him have it. He played just 35 games for New York the following season, collected another $17 million and left baseball for good.